Finally! The weekend has arrived. I can’t tel you how incredibly busy this week has been for me with a lot of stressful deadlines and a lack of sleep. I kind of felt like I was constantly in war with time to get everything finished in time. You can imagine how much I am looking forward to a well deserved break. Plans so far for the weekend include listening to Santigolds album ‘Master of My Make-Believe’, try coping with the upcoming cold weather and getting lots and lots of sleep to catch up. But let’s get back to the outfit. In this outfit you can fiend back parts of my war against time. The look is has a combat like feel without using the cliché combat colours. That’s something I wanted to try out for myself as a little test. Instead of using an army print I teamed my white shirt with an amazingly cool off-white vintage body-warmer. 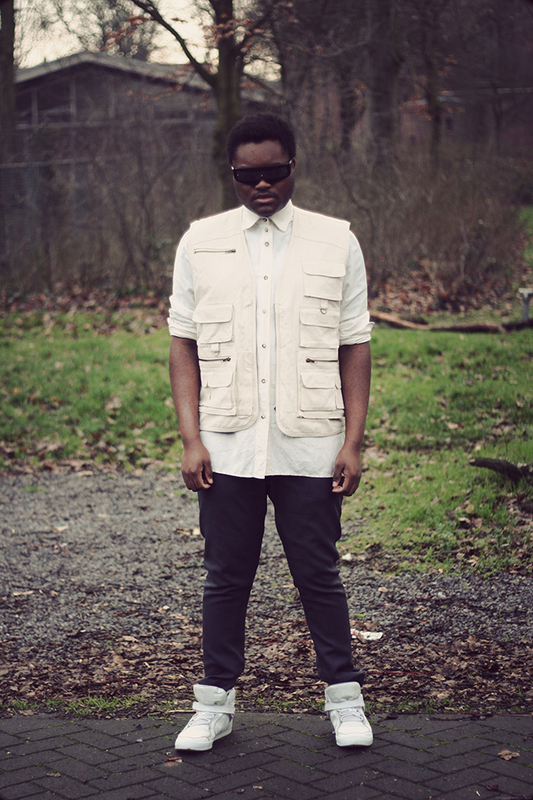 The body-warmer and sunnies give the look a certain kind of toughness I really wanted to portray in this look. So let me know what you think. Have I created a new trend for 2013? Hii Haylee, The weekend is over now and I managed to get a lot of sleep! Echt grappig dat er ook ritsjes aan de achterkant van die bodywarmer zitten! Onwijs leuke outfit! Stoer maar toch luchtig. Ja hé! vond ik ook al zo leuk aan het giletje. Ik vind deze look zo gaaf! De bodywarmer staat je super en de combi met het nette blousje is super Chris! tof! Staat je heel goed! Ja ik vind het leuk! En juist omdat de bodywarmer niet die standaard kleur groen of legeprint heeft, maar wel die 'combat like feel'! Staat lekker fris. Dat vestje en je zonnebril zijn erg gaaf! Stoer! Ik hou wel van zwart wit outfits. Hi, I just read your blog and I love it! Maybe take a look at mine? Black and white is always an amazing combo, and you look really good! Heel leuke outfit, en wat een gave bril! Nice outfit ! i like your sneaker ! Thanks for your kind words Charly! Wooow this look is pretty electric and has a kind of futuristic vibe, you look great! hee christian wat een supergave outfit ! hey, you just look like will.i.am. great vest, is it bulletproof? Hii Andudei! Haha, it's not! nice outfit, ve a great weekend.